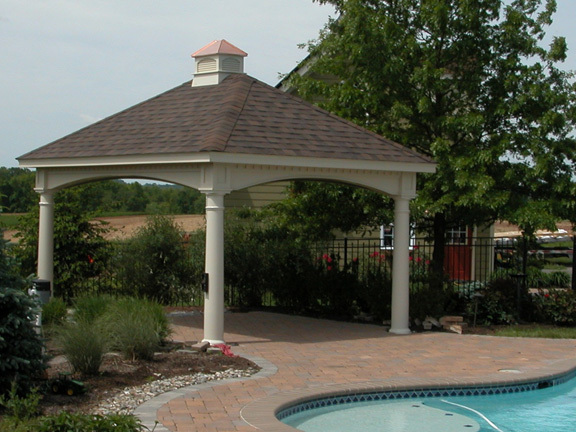 Our Arched Vinyl Pavilions are one of our most popular pavilion designs. 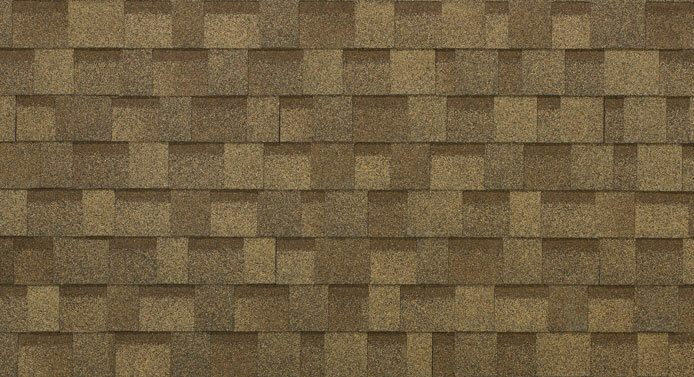 * Constructed with furniture grade, kiln dried pressure treated southern yellow pine, then wrapped in vinyl. * Will last for decades with or without minimal maintenance. 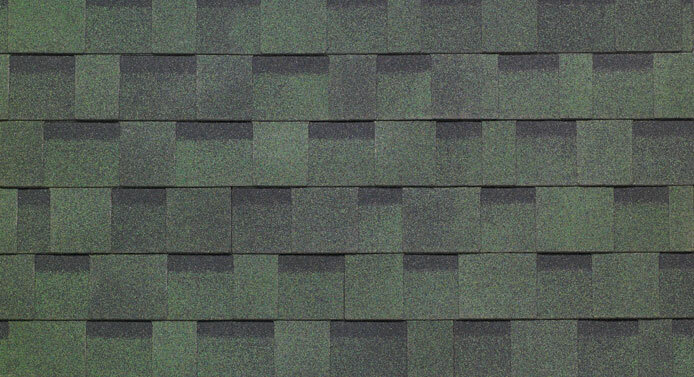 * Fully customizable to any size - rectangle or square. * No exposed fasteners – Mortise and tenon internal craftsmanship. 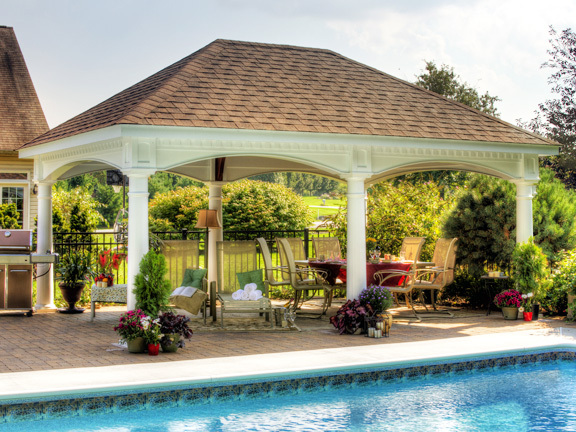 This arched pavilion is the ideal poolside shelter for staying cool and entertaining guests all summer long! 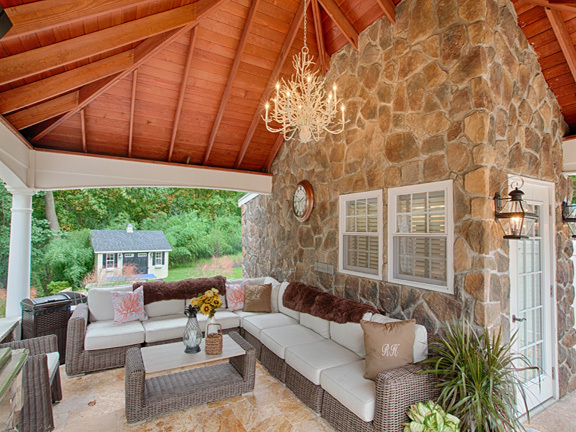 This backyard oasis provides shelter and shade all summer long and is the perfect place to relax after a long day. 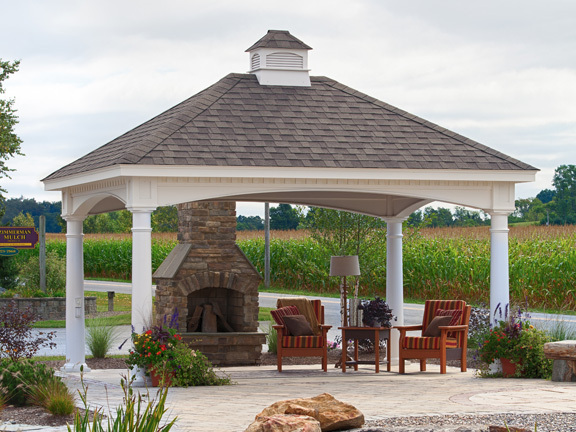 This pavilion was designed around a beautiful fireplace that serves as a great centerpiece and will impress for years to come. Need a fan? No problem! Just let us know. 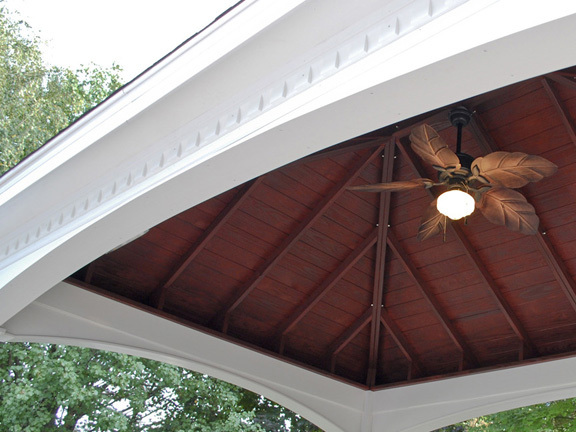 As an option all of our pavilions can be prewired for fans, lighting and outlets. Just be sure to select the electrical package in our Pavilion Builder tool and specify what you like and where you'd like it!. 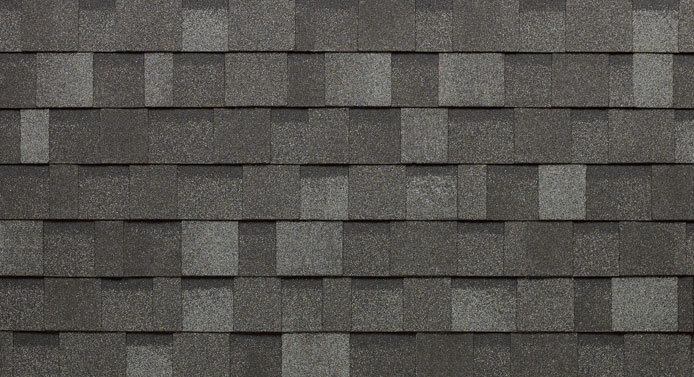 No detail escapes the professionals at Baldwin, our expert craftsmen and design team provide our clients with decades of combined experience. 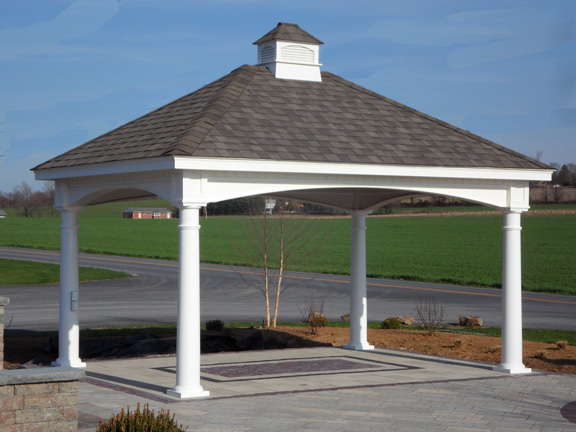 All of our arched pavilions come standard with 10" round columns. 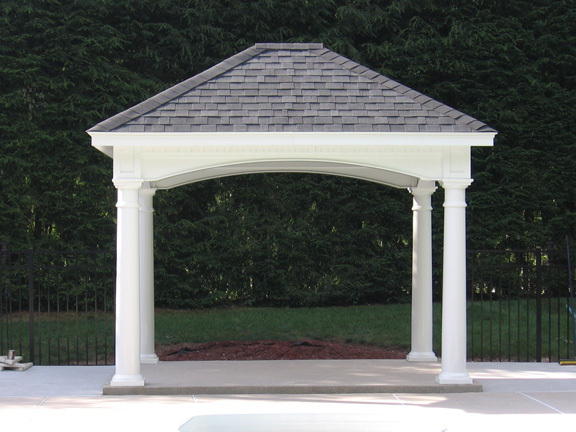 Round columns with Tuscan trim provide a timeless aesthic to any pavilion. 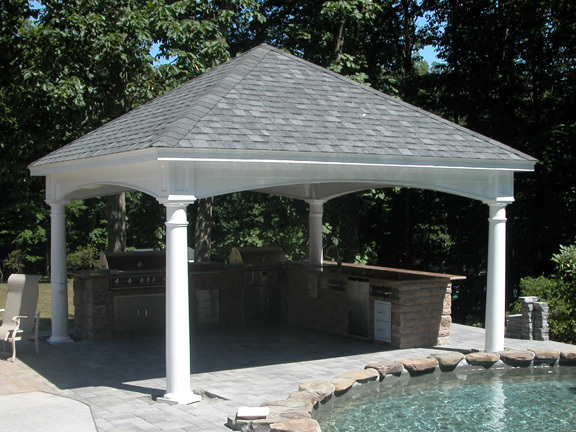 Fiberglass columns are available as an upgrade. Need shade? 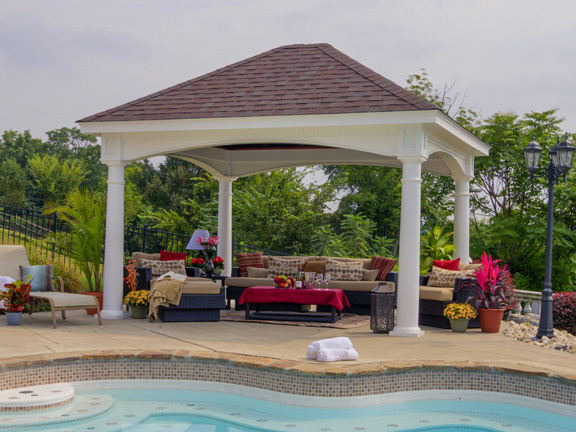 A Baldwin Pavilion is the perfect addition to any patio! 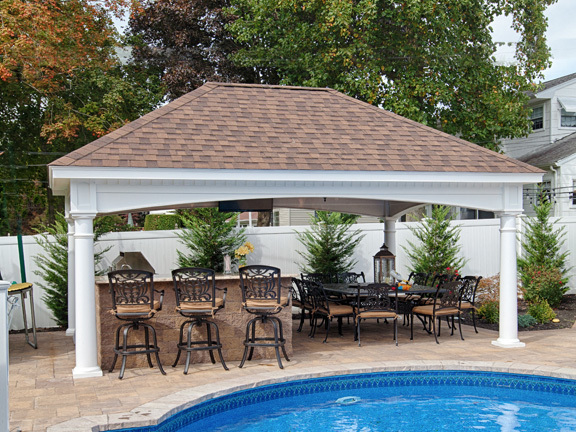 Call us today to speak with one of our expert design consultants. 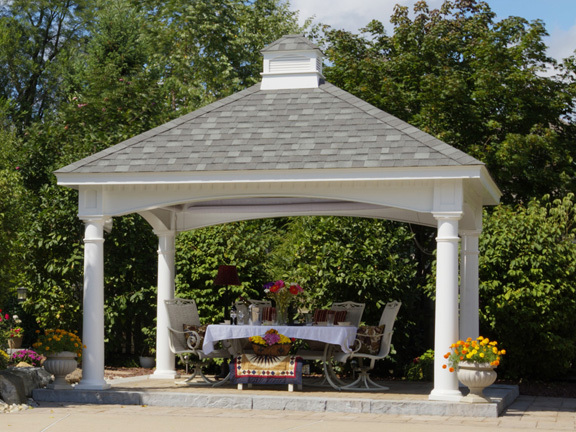 Our arched vinyl pavilions are available as kits in standard configurations or can be customized and integrated into existing structures. 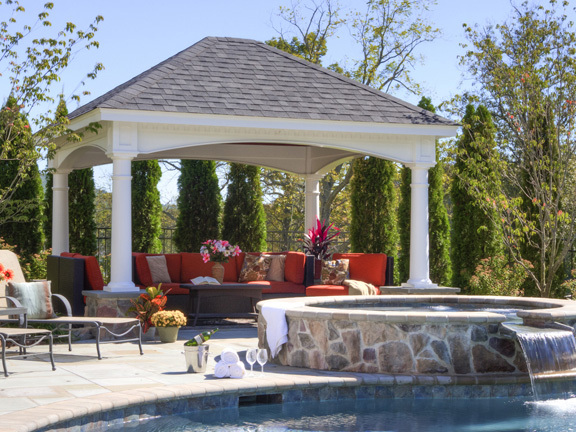 This pavilion was custom designed to serve as a cabanna. 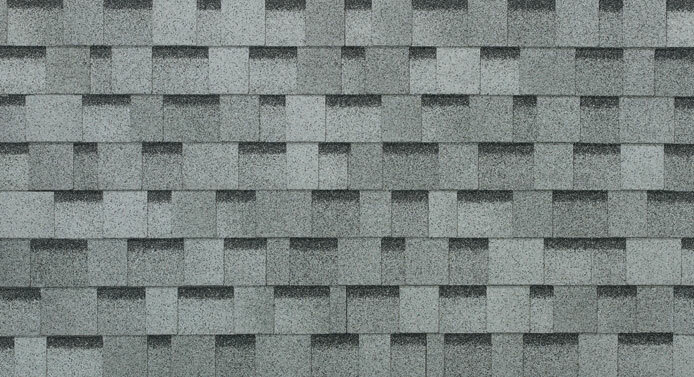 It was neatly integrated into a masonry structure for a beautifully seamless appearance. 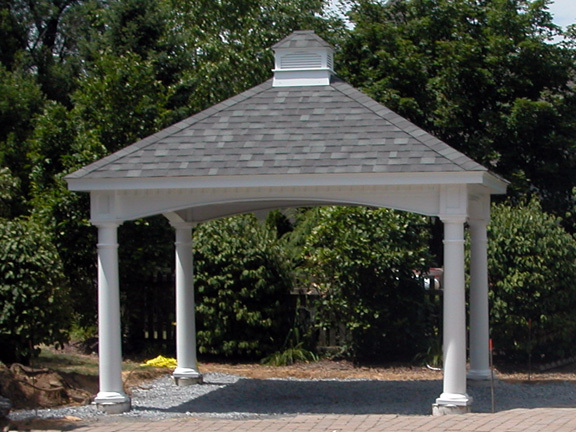 This is an example of a smaller pavilion that was purchased as one of our standard kits. 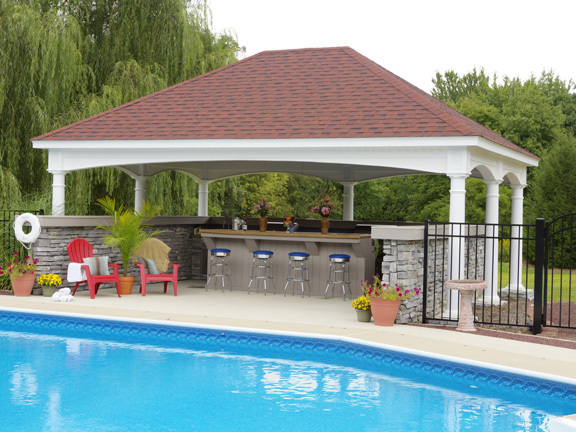 Not only is it a wonderful addition to the clients patio, it was affordable and easy to assemble. 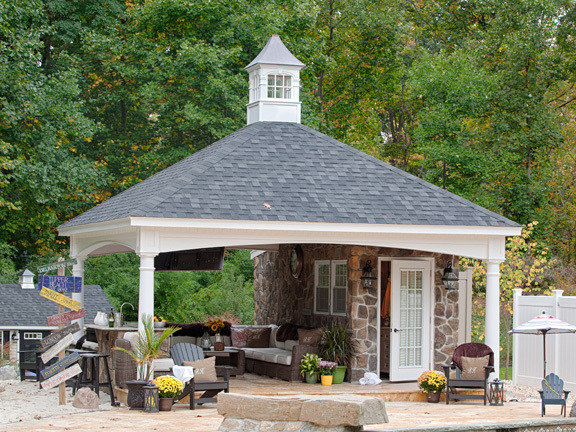 This pavilion is shown with a functional cupola roof. 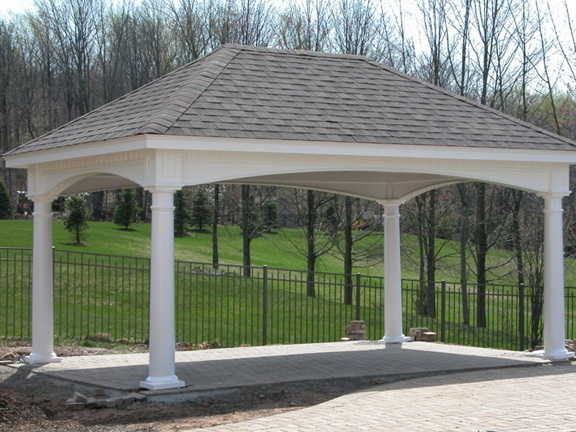 This cupola is fully functional and vents air from the pavilion, it's also a great way to add distinctiveness to a roof and can be added in our Pavilion Builder tool! 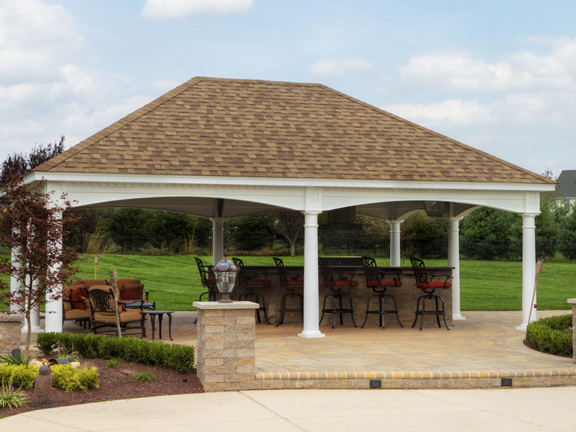 This pavilion provides great cover for an outdoor kitchen and is perfect for entertaining guests year round! Determine where you want the center of your posts. Measure from center to center in width and depth. 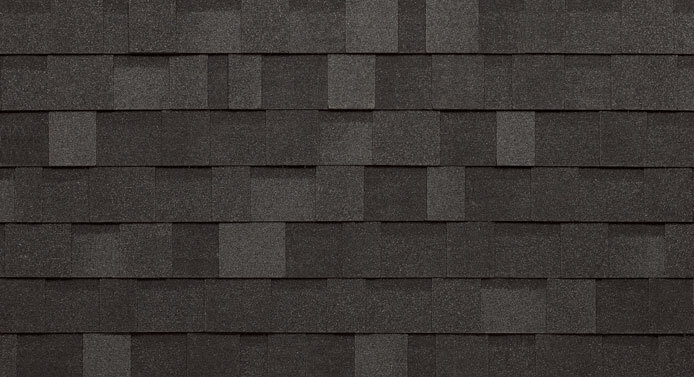 Our pricing tool is based on standard sizes, mostly in two foot increments. If you want a 9x13, you can get that, but you end up paying for a 10x14. Consider height and sight lines. 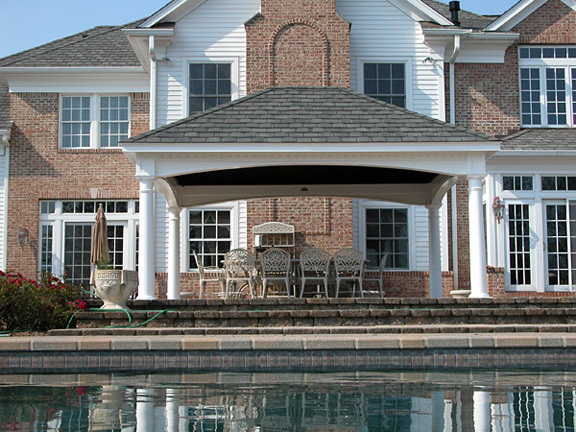 Remember, short pavilions give more shade directly under the pavilion. 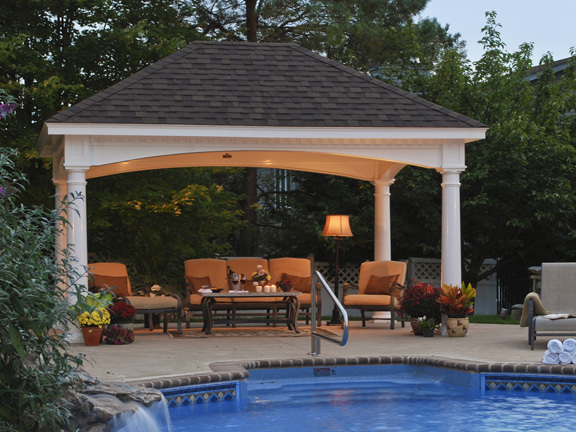 Consider the time of day you will use your pavilion and the angle of the sun at that time. 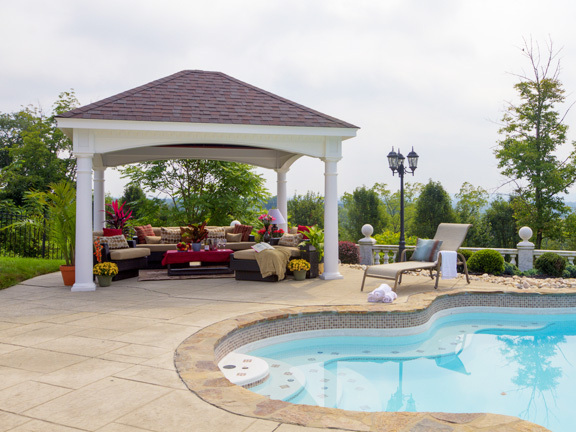 We may be of more design assistance if you take a few photos of your site and send them to us. 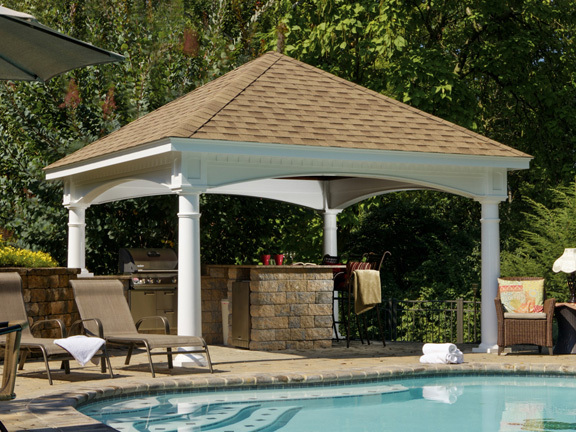 We have an online pricing tool you can use to configure your pavilion. 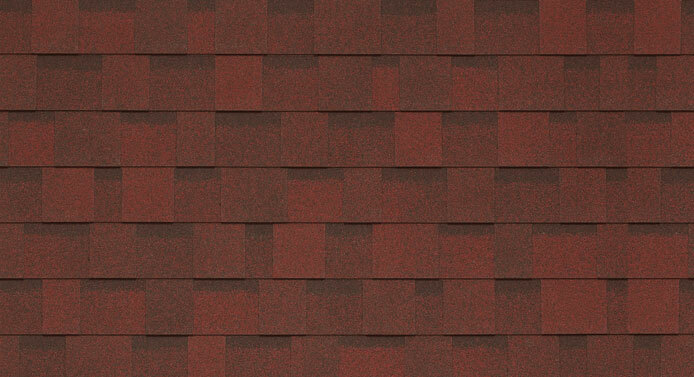 When you are using the pricing tool, you will need to select your options such as: The width and depth, stain color and if you want a cupola. 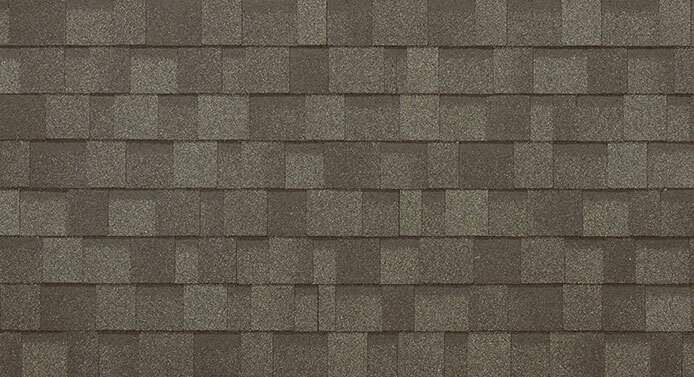 The pricing tool will give you a price for the pavilion, your electrical options and even a trucking quote. 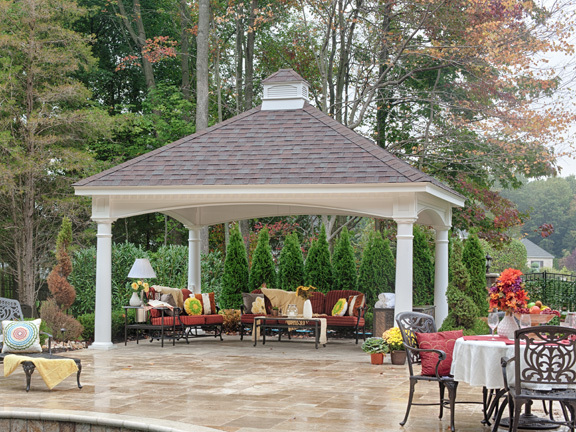 It’s easy to modify your pavilion until it is exactly what you desire. You can feel comfortable using this no dicker, always accurate pricing tool. 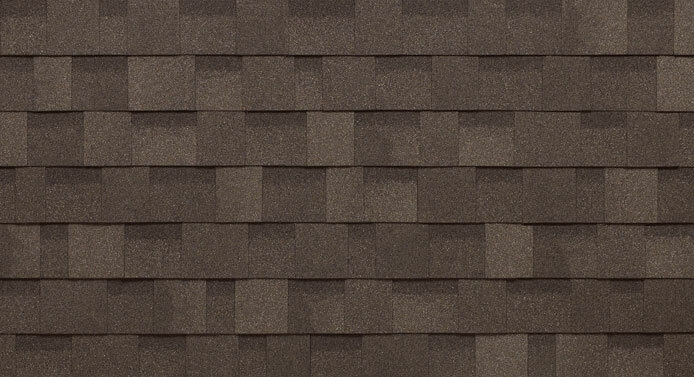 We do reserve the right to adjust prices due to lumber costs without notice. If the pavilion you desire cannot be built using our system, please enter the pavilion as close as possible then describe what you would like done differently in the notes section. You can also call our sales team during business hours (EST) at 800 344-5103 x 1 and they will do all of this for you. 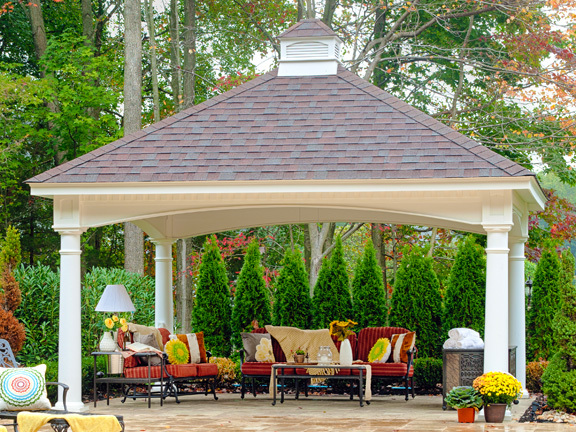 When you are pleased with your pavilion and are ready to talk to one of our designers, click the “Submit information” button. Your data gets sent to us. Customers who live within 100 miles of 06457 can choose our installation service. 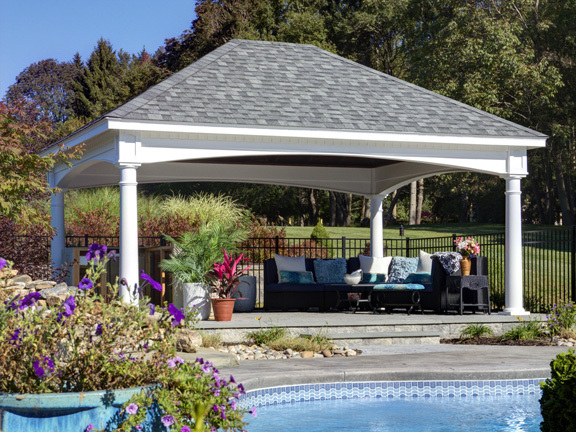 Baldwin Pergolas and pavilions are designed to be very easy to put together, but their are still difficult aspects such as using a level to determine the lengths of the posts, cutting the posts to length, drilling the concrete and anchoring the mounting brackets. If this sounds like more then you want to do, we may be able to suggest experienced installers in your area. 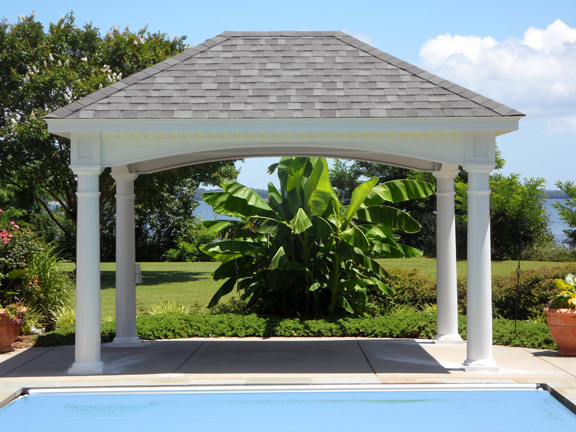 Use the following chart as a guideline to learn what an Arched Pavilion might cost. 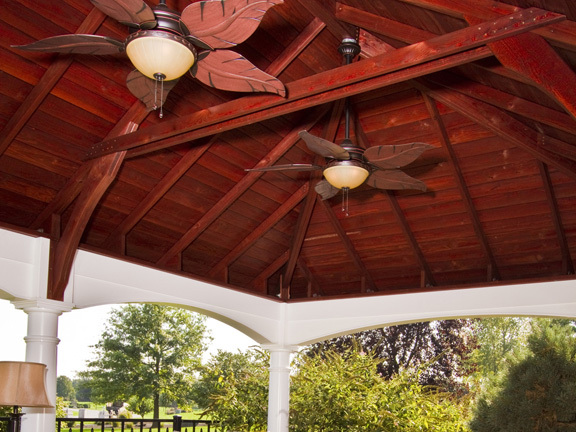 More precise pricing and selection of options can be found by designing your pergola using our custom pricing tool link, below. A complete kit with all hardware and instructions needed for the assembly. 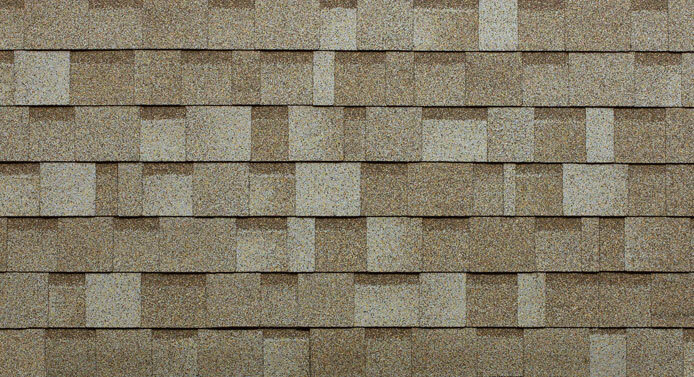 All wooden parts are kiln dried, pressure treated, southern yellow pine and concealed within heavy gauge vinyl sleeves. 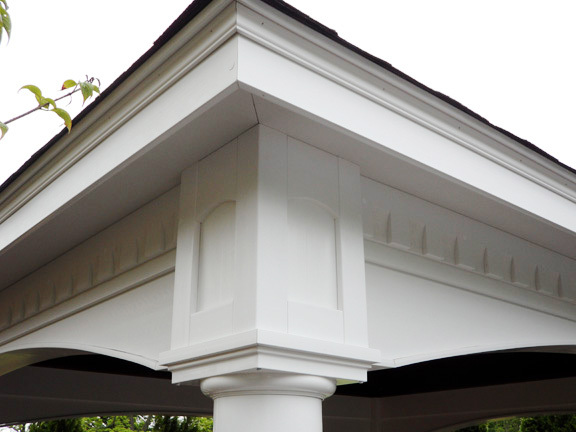 10" Round, tapered, vinyl columns with Tuscan style capitals and bases. 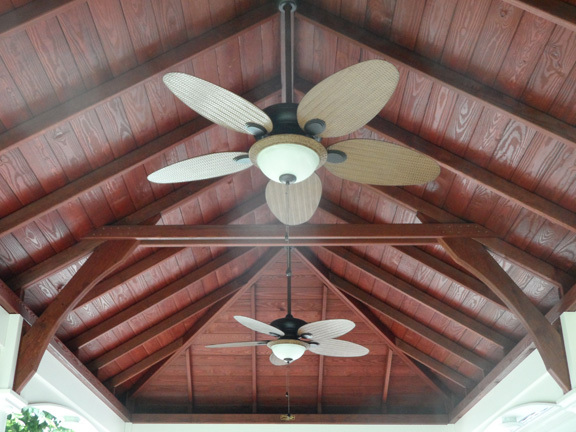 The arched beams add charisma and are designed to support heavy roof loads. 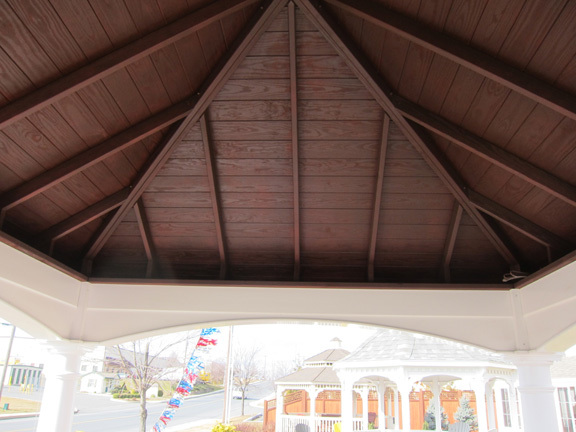 The beams are trimmed with our decorative dental molding and feature a 12" roof overhang. 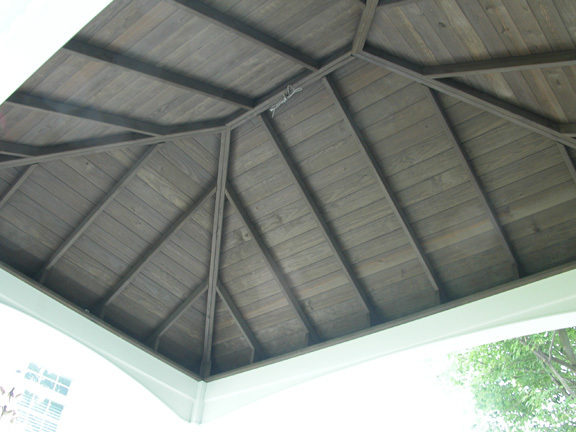 No lumber exposed to the sun, but the inside cathedral ceiling is mahogany stained 1x6 tongue and groove. 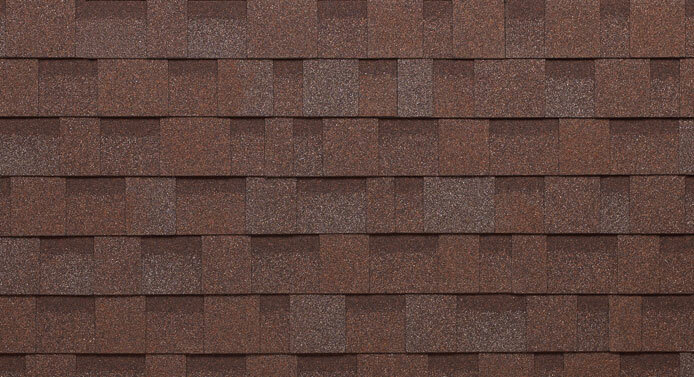 The steeper roof pitch is 7/12 and adds character. 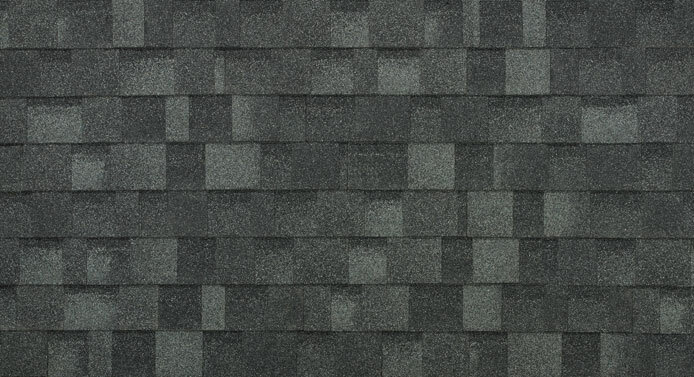 It is constructed with double hip rafters and covered with architectural, 30 year asphalt shingles. 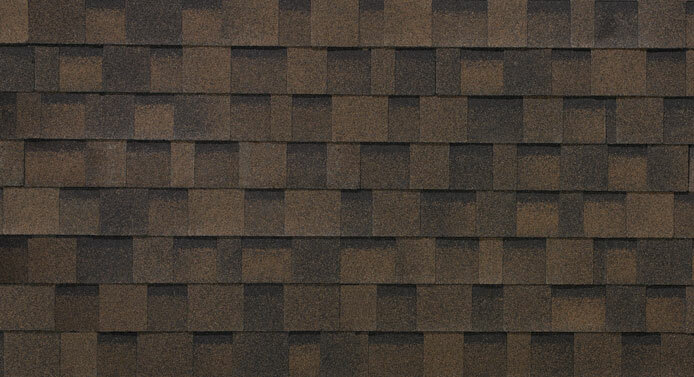 All hardware is weather proof and concealed. 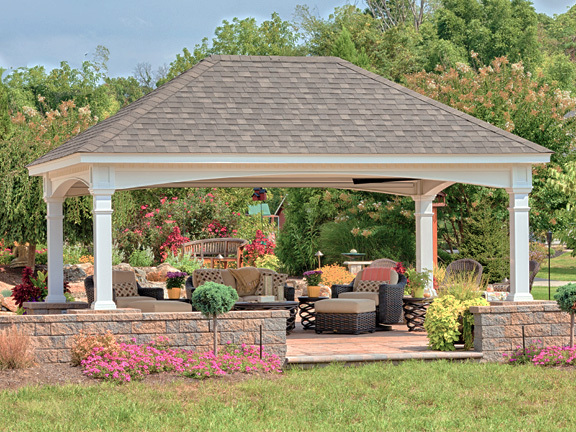 Our pavilions are engineered to withstand 140 MPH Winds and 45 PSF Snow Loads. I was very impressed with how easily the assembly went - the process was intuitive, every part just dropped into place. 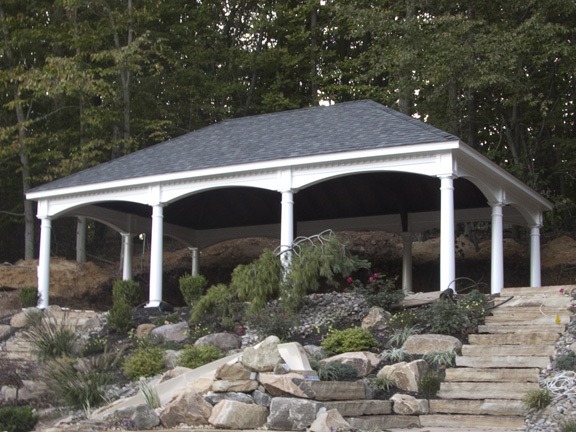 The Pergola really is stellar, and your design features really lend themselves to our theme of an American \'Japanese Tea House\' with the layered and staggered entablature, rafter, and purlins. 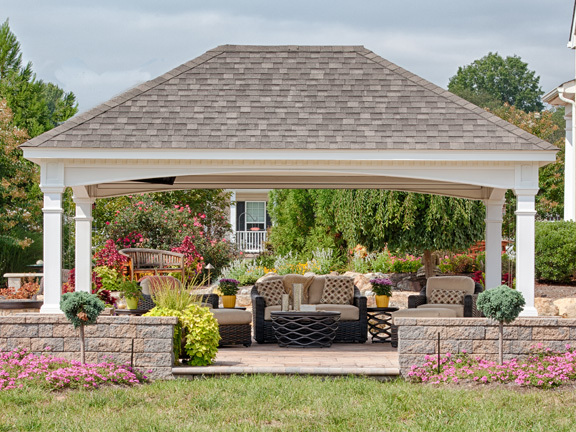 We have shown the Pergola to several neighbors and friends and now they are bringing their spouses and relatives to come look at it and its view overlooking the terraced garden.